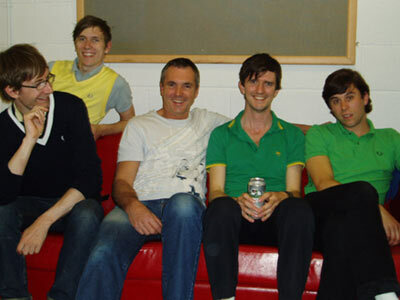 The Rakes played their most bizarre gig of their career alongside Dr Karl Kennedy of the hit Australian soap Neighbours. Taking part at the newly opened 53 Degrees venue in Preston it was part of the Longest Night celebrations which saw students ending the term dressed as nurses, firemen and Daffyd "The Only Gay In the Village" from Little Britain. "We don't get a lot of British indie music in Australia cos it's so hard to get anything on the playlists. So my British band experience is all the classic stuff like Oasis. I really like The Killers and there's so much good thrashing rock n roll around now. My biggest influences were probably Elvis Costello, The Clash and a lot of punk stuff...It's kind of interesting that Natalie Bassingthwaighte (Izzy Hoyland in Neighbours) is the lead singer for Rogue Traders and their first single together was "Voodoo Child" features a sample of Elvis Costello's "Pump It Up"
But the highpoint has to be Harold's disappearance. The drama as you saw his glasses on the rocks...and then his resurrection was amazing!!!" "He was picked up by a fishing trawler with Amnesia and taken to Tasmania where he lived for quite some years, before going back to Erinsborough not knowing who he was and living under a different name until he was spotted by his ex-wife"
Fletcher's set was a bizarre mix of cover versions, including Robbie Williams "Let Me Entertain You", Oasis' "Don't Look Back In Anger", Baddiel and Skinners "Three Lions", and his own original material. He chose not to play his Russell Crowe meets Billy Bragg styled anti-war song "Perfectly Comfortable" or the track he wrote with Jackie Woodburn, who plays Susan Kennedy in the show, and left the stage covered in knickers and thongs from the female fans at the front. The Rakes set included recent single "Retreat" as well as the modern classic "Strasbourg". The band continues on a more conventional tour before playing Glastonbury next month.